Because effectively managed collaboration and communication is the key to organizational success. Hover over highlighted sections to learn more. A graph visualization is a powerful tool when analyzing a social network. On an overall level, the visualization shows how fragmented a network is as well as its density. A dense network will have a high number of ties per person. A natural grouping of people based on their interaction alone. Often it is interesting to compare cluster with how you are formally organized. A person mediating contact between otherwise disconnected groups. Depending on the survey context, bridge builders can also be seen as bottlenecks. This person is the closest to everybody else in the network. In other words, this person has the fewest "steps" to reach all of the others. 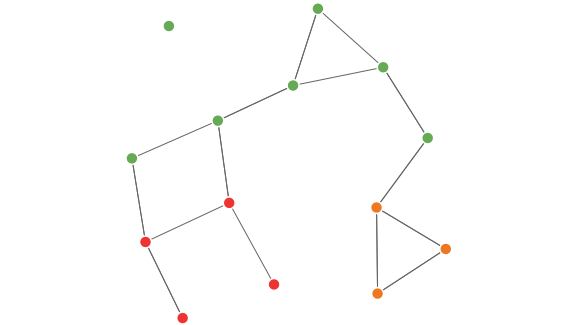 The graph's force-directed layout will place such central individuals and groups in the graph's center. Someone without any connections is isolated. It is important to be aware of the context, i.e., the particular type of interaction being studied and who is included in the study. Focusing on the orange department, we can see they are fully connected internally. We can also see they only use 5% of the possible connections (1 out of 21) to the green department and has no ties to the red department. Get an overview of the collaboration within and between groups such as geographical units, project teams, and business units. Identify close-knit groups and organizational silos within your organization - and the individuals who tie them together. Characterize your organization with regards to being fragmented or centralized and general level of collaboration for knowledge sharing, innovation, communication, and collaboration. Find individual connectors, bridge builders, bottlenecks, and influencers within your organizational network. Unilever Procurement was looking at how they could improve cross-regional collaboration. To help them they commissioned Silverman Research. Free plan available to help you get started.